Are you interested in growing your fundraising, marketing, membership recruitment, programmatic, grant writing or other skills? If you are in the Denver metro area and would like to volunteer in the PATH Intl. office, we'd love to have you. Many projects are electronic and can be done from anywhere. Email Megan Ferry if you're interested in helping out. Thank you. Advertise your product to 4,400 PATH Intl. Instructors and 850 Member Centers? Join PATH Intl. as a Corporate Member. Corporate members receive discounts on advertising in PATH Intl. Strides, exhibiting at the international conference and social media posts. Check it out on the PATH Intl. Corporate Sponsorship page. Any questions, contact Megan Ferry or call her at (303) 452-1212, ext. 107. PATH Intl. and the American Paint Horse Foundation have teamed up to provide scholarships for PATH Intl. therapeutic riding certification. Designed to benefit those who wish to further their education, this alliance will provide scholarship assistance to potential instructors of therapeutic riding. Click here for more information. Applications must be postmarked by March 1, 2013. Hurricane Sandy devastated the eastern seaboard of the United States in late October and early November 2012, leaving dozens dead, thousands homeless and millions without power. Unfortunately, the buildings of Staten Island Recreation Association, a PATH Intl. Center in New York, were completely destroyed by the superstorm. Luckily, because of past donations from members, the PATH Intl. Disaster Relief Fund is able to help fund the feed and care for the horses of the Staten Island Recreation Association while the center rebuilds this spring. 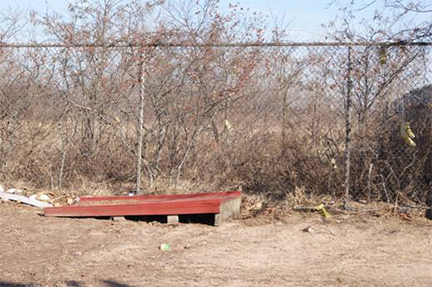 Part of the ramp about 300 feet from the main part - both about 150 feet from where the ramp started. 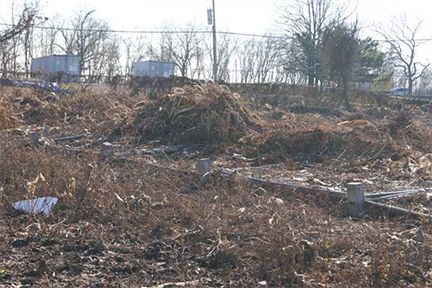 Perimeter fence flattened plus debris: all this was under eight feet of water. Please contribute to the Disaster Relief Fund and hopefully help meet the needs of the next disaster victim. Thank you for your support! You, your organization or your research can help improve the equine-assisted activities and therapies field. Individuals interested in presenting at the 2013 PATH Intl. 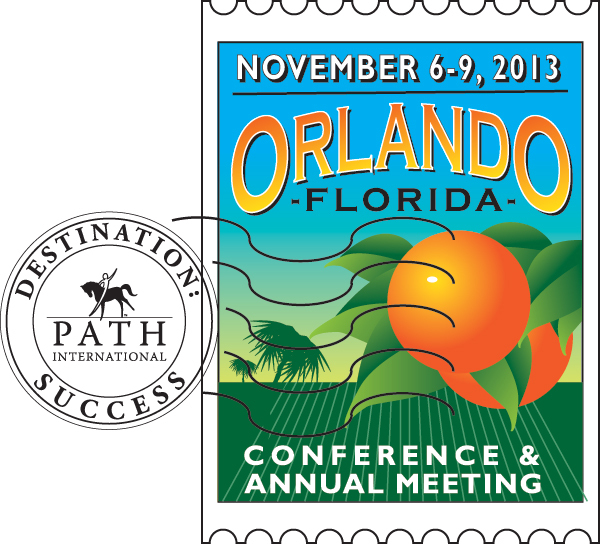 Conference November 6-9 in Orlando, FL, are invited to submit a completed abstract submission form to PATH Intl. Abstract submission will be handled electronically only. Click here for information and guidelines . Click here for the abstract submission form. Submit an abstract and help make this conference one of the best ever! Do you have a talented equestrian at your PATH Intl. center? Do you admire a particular instructor or an equine specialist in mental health and learning? Does a special horse, mule or mini who has a priceless attitude call your center home? Do you know of a volunteer or veterinarian who generously gives time at a PATH Intl. center? Now is the time to recognize their efforts and submit an award nomination for these special individuals and animals. Nominations are due no later than 12 midnight, MDT, May 20. Click here for more info and for the fillable nomination forms. PATH Intl. welcomes back Freedom Rider and Ohio University Southern as exhibitors for the 2013 PATH Intl. Conference and Annual Meeting, November 6-9, in Orlando, FL. If you are interested in selling your products to nearly 1,000 instructors, executive directors and other decision makers, detailed information on exhibiting in Orlando can be found here. Questions? Call or email Megan Ferry at (303) 452-1212, ext. 107. See you in sunny Florida! To apply, please complete a volunteer application form. Return application and resume to Corey Campbell. Email Corey or call her at (800) 369-7433, ext. 104, if you have any questions. Do you have questions about what to expect on an accreditation site visit? Are you unsure how to interpret a specific standard? Do you want to find out how your center can comply with the standards? Ask the experts! The PATH Intl. Accreditation Subcommittee and your fellow PATH Intl. Members are on Community Connections to answer your questions. Log in to PATH Intl. Community Connections, join the Standards & Accreditation community and receive expert advice. Through a PATH Intl. partnership with Equine Network, your favorite equine magazines such as Equus, Dressage Today and Horse and Rider are available to PATH Intl. Members at much reduced rates. Click here for magazine subscriptions as low as $10. Good reading! wasnamed the 2012 PATH Intl. Volunteer Veterinarian of the Year recipient at its annual conference in November. "A record number of nominations were received this year, but two rose to the top", said Lynn Coakley, EQUUS Foundation President, who with John Long, USEF CEO, presented the award. In addition to the recognition of winning this prestigious award, the recipients receive a $5,000 grant from the EQUUS Foundation to be awarded to a horse-related charity of his or her choice. Colorado Therapeutic Riding Center, a PATH Intl. PAC in Longmont, CO, and SMILES (Special Methods in Learning Equine Skills), a PATH Intl. PAC in Darien, WI, will each receive a $5,000 grant. The purpose of the Riders Assistance Fund is to assist a child (must be born after January 1, 1994) who would not otherwise be financially able to participate in a therapeutic horsemanship program at a PATH Intl. Premier Accredited Center. Thanks to the generosity of its donors, in 2013 PATH Intl. is able to fund one $300 need-based scholarship. Riders Assistance Fund applications are on the PATH Intl. website under My Center membership (you must be logged in). The application is due February 15. If you have any questions about this scholarship, please contact Megan Ferry, (303) 452-1212, ext. 107. When evaluating a horse, an experienced eye should assess for balance, structural correctness and type. These are the fundamentals on which conformation is built and enables proper and smooth movement and a greater chance for a sound horse. It is important to evaluate a horse standing correctly from the sides, front and back and then watch the horse walk. Watch the horse walk away from you, walk toward you and, lastly, watch the horse walk from the side. Read more. The PATH Intl. Equine Welfare Committee encourages positive and engaging educational exploration from our readers; we'd love to hear your feedback! Let us know if you have any questions about our tip or have a suggestion about specific topics you would like covered in the future. Email Kristin Mason, EWC chair . Thank you! Join us in the online PATH Intl. Equine Welfare Community! Participate in lively, thought-provoking and sometimes controversial discussions in the PATH Intl. Equine Welfare Community. No matter your specific interest (EFP, therapeutic riding, hippotherapy, carriage driving, interactive vaulting, etc. ), they ALL involve working with equine partners. Exchange ideas, ask questions, offer comments and suggestions, and "pick the brains" of some of our industry's most experienced and qualified people. Access the forum through the PATH Intl. website by clicking on the Community Connections button in the left menu. If you have any questions about joining the PATH Intl. Equine Welare Community, please email Moderator Patty D'Andrea. Congratulations to People and Animal Learning Services (PALS), a PATH Intl. PAC in Bloomington, IN, which has been awarded a $50,000 grant by the Community Foundation of Bloomington and Monroe County in support of the organization's "Gallop for Growth" capital campaign. Designed to provide a matching-funds opportunity for supporters of the campaign, the grant will ensure the acquisition of a new program facility for the PALS program by March 2013, providing an opportunity for expanded service offerings and community collaborations.